I think I’ve finally made peace with being home from Quilt Bliss. What a fun weekend it was! When Pamela asked me to help with some sewing in preparation for the retreat, I jumped at the opportunity. 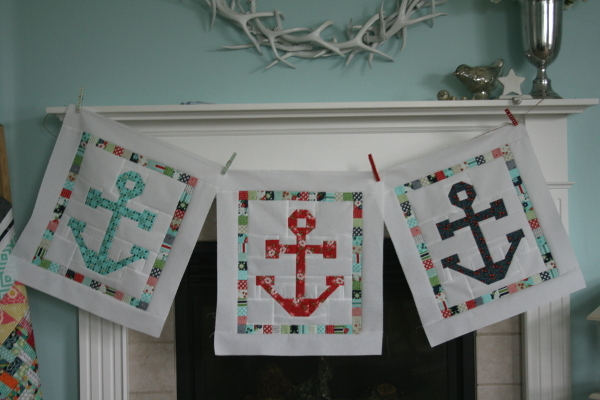 Soon thereafter, a pile of DaySail by Bonnie & Camille was on my sewing table for cutting. 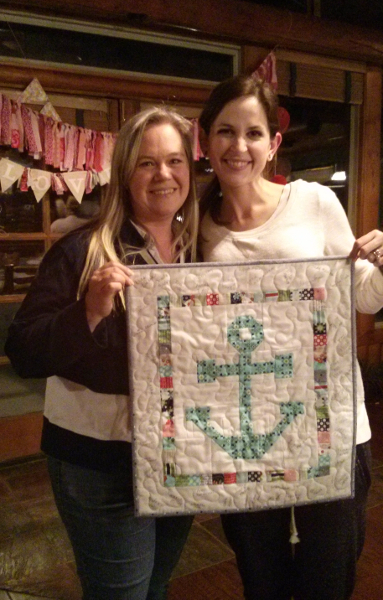 These anchor mini quilts were used as gifts for the teachers (Pamela’s awesome idea! ), and were a lot of fun to make. 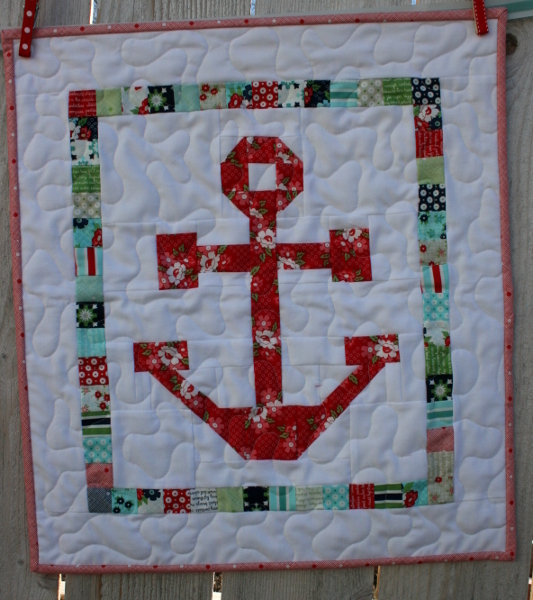 I used my Anchor Quilt block and made four separate blocks. Instead of leaving them at 14.5 inches square, I trimmed the two sides so the block was 12.5 inches wide and 14.5 inches tall. 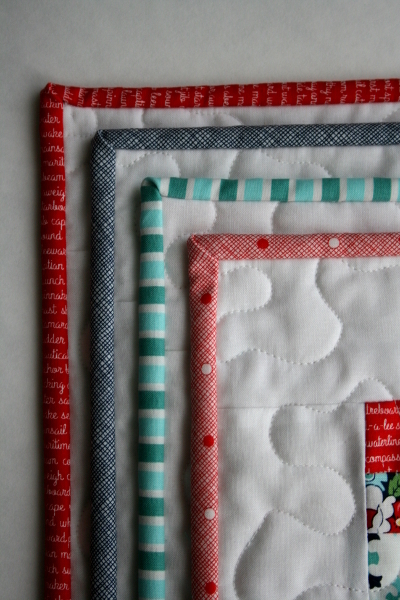 I then sewed 1.5 inch squares together to make strips which were used as borders. 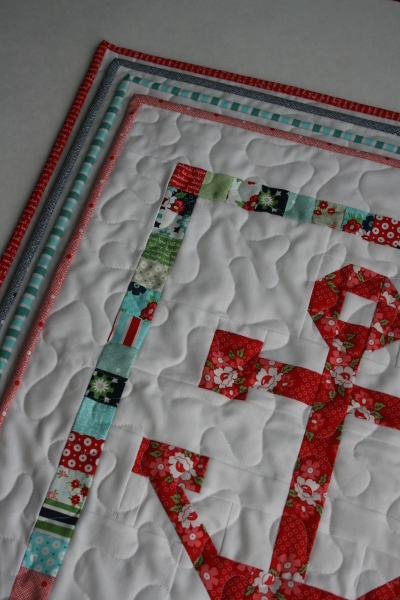 A white border followed the scrappy squares. The red floral print above was one that surprised me. 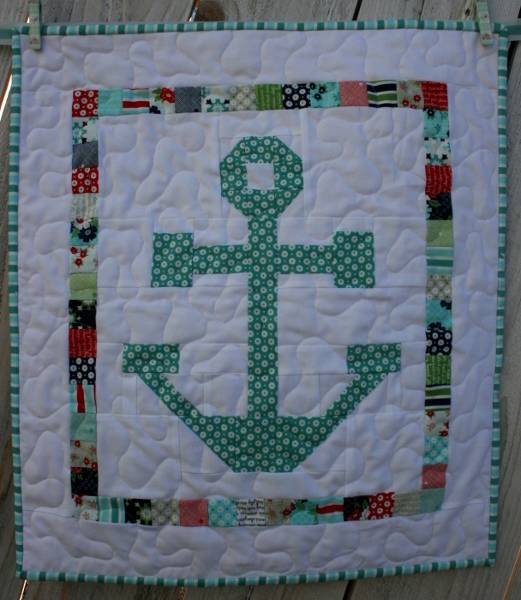 I didn’t anticipate it being in my top 3 favorites in the Daysail collection, but I really love it! Which one is your favorite? There are so many great blender prints in the Daysail collection, as well as several that make awesome bindings. I really enjoyed putting these together and experimenting with different combinations. The stippling was done by Ella Lung, who did a beautiful job! 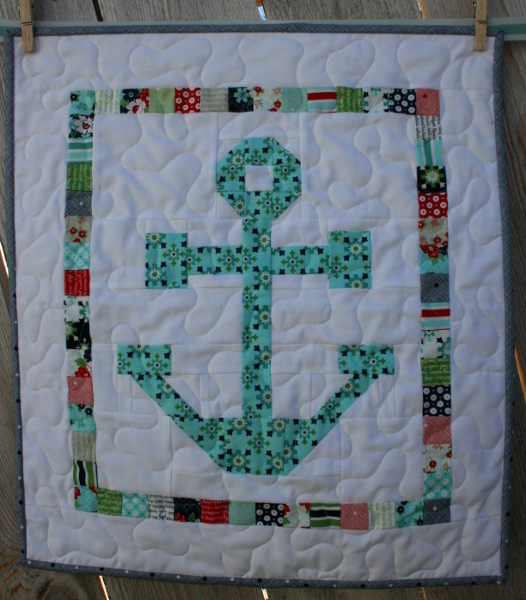 I really enjoyed making anchor blocks again. 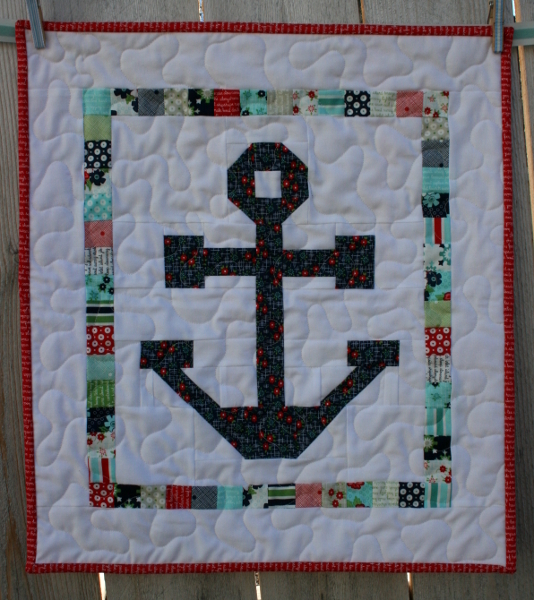 I love my original anchor quilt, but it might be fun to make another version in some colorful nautical themed fabrics. 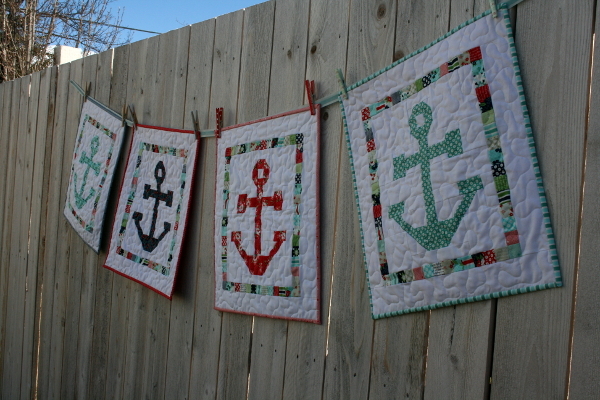 While finishing these mini quilts, a friend suggested one more use for them that I hadn’t thought of. I’m working on it now and am excited to share it soon! 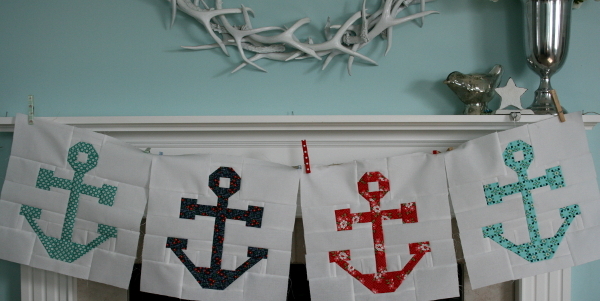 The mini quilts sure turned out cute. I am sure everyone who was lucky enough to get one was very happy!